On Monday Patriot Coal Corporation closed two western Kentucky mines. On New Year's Eve the company announced the mines will be closed. The effects will be felt beyond Kentucky, as a Republican member of Illinois' Saline County Board, Joe Jackson, points out. Jackson said the negative impact on Saline County is from regulations placed on coal mines by the government. "We know that those places wouldn't be closing if it wasn't for (President) Obama and the federal Environmental Protection Agency and the regulations on burning coal,” he said. State Rep. Brandon Phelps, D-Harrisburg, said while the shutdown does affect residents in his area, he is not sure how many people were impacted. "I have no idea how many because I haven't heard from anybody," he said. Obama--and the Democratic Party which Phelps belongs to--are waging a war on coal. And jobs. Chicago patriots--yes, there are some--may luck out and be spared the presence of the Obama presidential library. The Barack Obama Foundation has major problems with the University of Chicago bid for the Obama presidential library and museum and is uneasy about the bid from the University of Illinois at Chicago, leaving Columbia University in New York the front-runner for the project. A source close to the foundation told me that the University of Chicago bid is in jeopardy because it does not own — and has no definite path to acquiring at present — any of the South Side sites the school proposed in its Dec. 11 bid. The land is owned by the Chicago Park District. 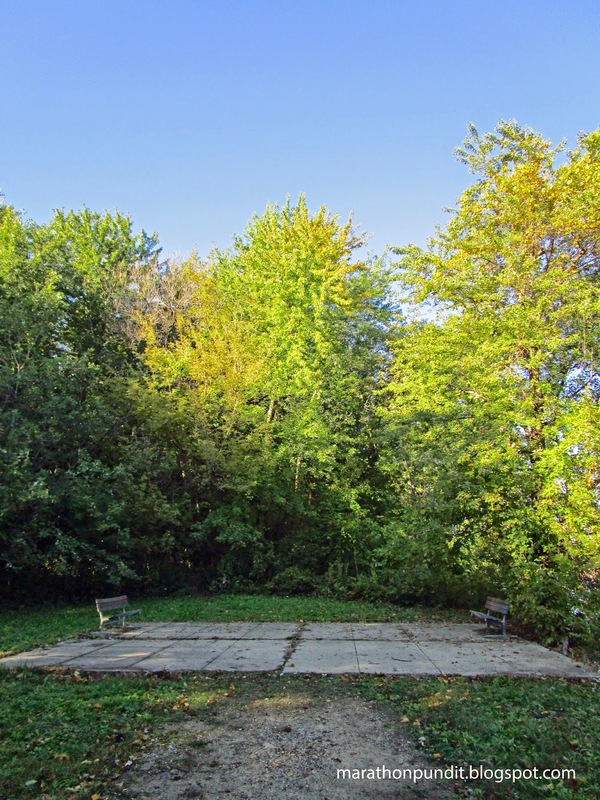 "There are major concerns with the three potential sites in the University of Chicago proposal given the fact that neither the school nor the City of Chicago control the sites," the source said. Meanwhile, the foundation faults leadership issues with the University of Illinois-Chicago's bid. Coincidentally, or maybe not, Obama's terrorist bud, Bill Ayers, was a professor at UIC for many years. 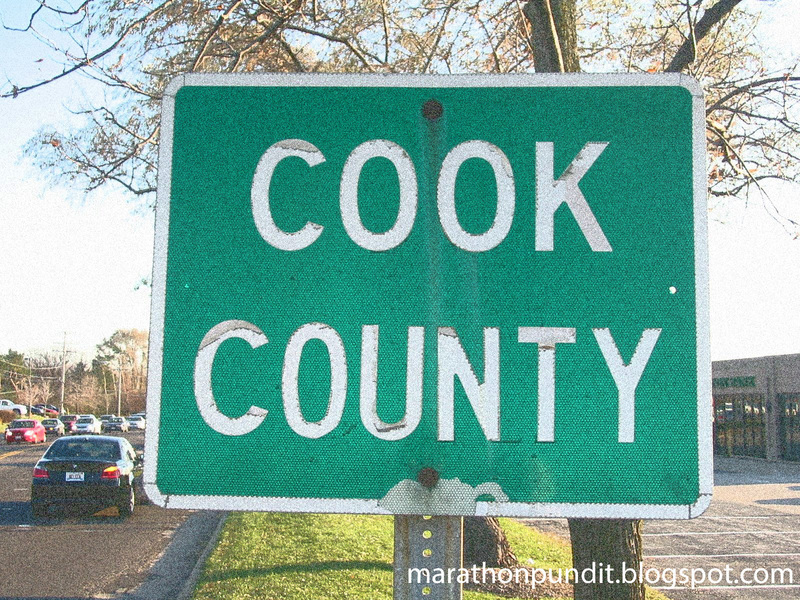 The rot of rampant graft and political shenanigans in Illinois continues to bear its foul fruit. More people moved out of Illinois than moved in this year, and the gap was the biggest among the 50 states, Allied Van Lines says. 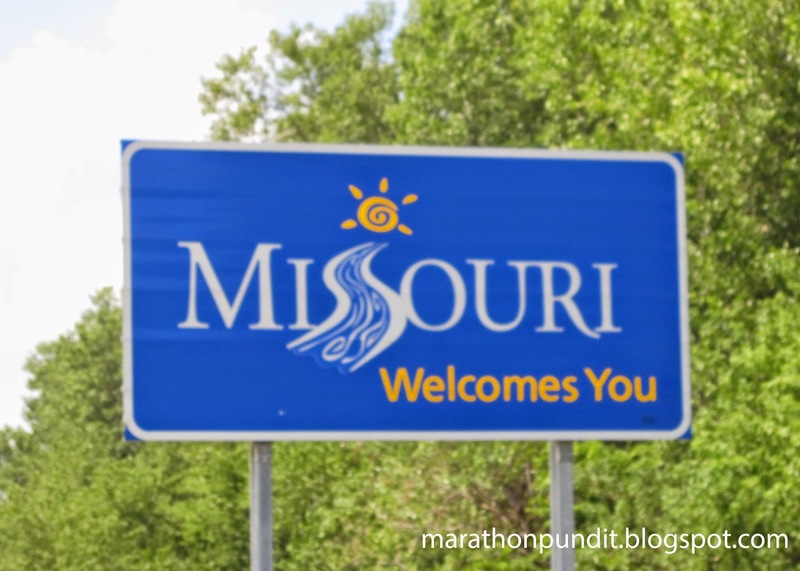 Illinois had a net 1,372 outbound moves in 2014, the moving company reported Tuesday. Allied is a subsidiary of Oakbrook Terrace-based Sirva Inc.
Allied handled 4,148 moves out of the state and 2,776 moves into Illinois during the year, according to its 2014 State Magnet Report. The other top hemmoraghing states, not coincidentally, also backed Barack Obama for president in 2008 and 2012. They are Pennsylvania, New York, Michigan, and New Jersey. New York City's embattled leftist mayor Bill DeBlasio was booed by audience members at yesterday's NYPD graduation ceremony at Madison Square Garden. Some attendees turned their back on the Democrat as he spoke. As if they didn't know already, DeBlasio told the newly-minted cops, "You will confront the problems that plague our society--problems you didn't create." However, a heckler answered back to the mayor, "You did." True, so true. As I've written before, hecklers are often quite right. Hat tip to American Power. Even her supporters have to admit that Hillary Clinton had a terrible 2014. ABC's Jonathan Karl review's Her Royal Pantsuit's annus horribilis. 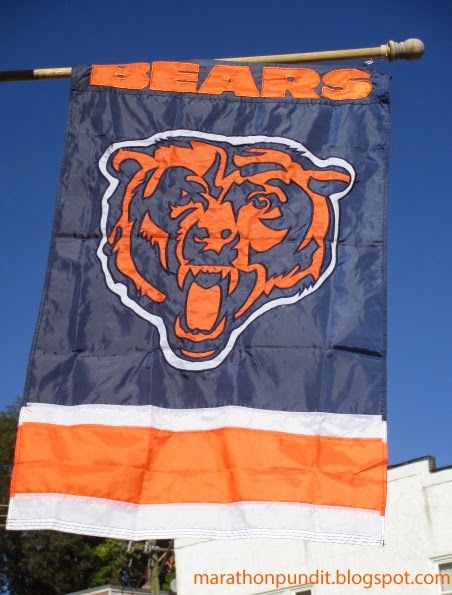 This morning the Chicago Bears fired head coach Marc Trestman after two miserable seasons. The Monsters of the Midway became the Milquetoasts of the Midway during his tenure. By all accounts Trestman was a failure, so it's interesting to read how Rich Campbell, the Chicago Bears beat reporter, described Trestman's coaching approach as a "lead-from-behind-style." Of course during the 2011 NATO conflict with Libya, a White House advisor described America's role there as "leading from behind." We are retreating with dishonor from Afghanistan this week, the rise of the Islamic State (ISIS) in Iraq and Syria last year has brought a reign of terror to those unhappy countries, and unlike this year, 2015 will arrive with Crimea being part of Russia, not Ukraine. Leading from behind brings failure. Just ask any Chicago Bears fan. Except of course Barack Obama. While on Meet The Press yesterday, New York City police comissioner Bill Bratton told host Chuck Todd that police officers "feel under attack from federal government at the highest levels." Barack Obama of course heads the federal government. Christmas didn't bring much holiday cheer to Chicago. Five people were murdered over the weekend and at least 18 others were wounded. As I write in my weekly entry at Da Tech Guy, the anti-cops protests are part of a decades-long conflict. From Da Tech Guy blog: The latest battle in the long leftist war, the anti-police protests. President Obama issued this whopper of a lie on Christmas Day at Kanehoe Bay Marine base in Hawaii. "But the world is better, it's safer, it's more peaceful, it's more prosperous and our homeland is protected because of you and the sacrifices you make each and every day." Safer? Certainly not in the last year, considering the rise of the Islamic State and that Crimea is no longer part of Ukraine. That's what the Washington Post's Bob Woodward said on Fox News Sunday just now. Over 25,000 police officers from across the nation attended the funeral of Rafael Ramos. Of course no church can hold so many people, so most of the worshippers watched the services on monitors outside. Hundreds of police officers turned their backs on a screen showing New York City Mayor Bill de Blasio as he spoke at the funeral of one of two officers killed last week in what has been called an "assassination." The funeral at the Christ Tabernacle Church, in the Glendale neighborhood of Queens, was broadcast to thousands of police who gathered outside. The killing of Officers Rafael Ramos and Wenjian Liu came amid heightened tensions between the police and the mayor over what some police saw as a lack of support for the force. 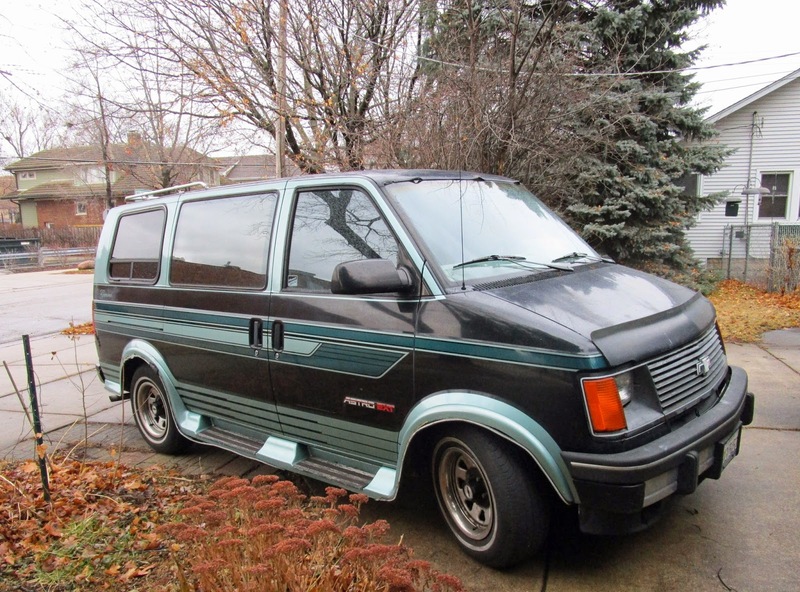 The first generation of the Chevrolet Astro looked back to the classic 1960s vans. The van was produced from 1985 until 2005. Pictured here is a 1992 edition that was parked in a Morton Grove, Illinois driveway a few days ago. The police and the military prevent us from becoming a "Mad Max" society. And some people don't like that. The New York Police Department says seven men have been arrested in connection with threats aimed at police following the fatal shootings of two NYPD officers last week. 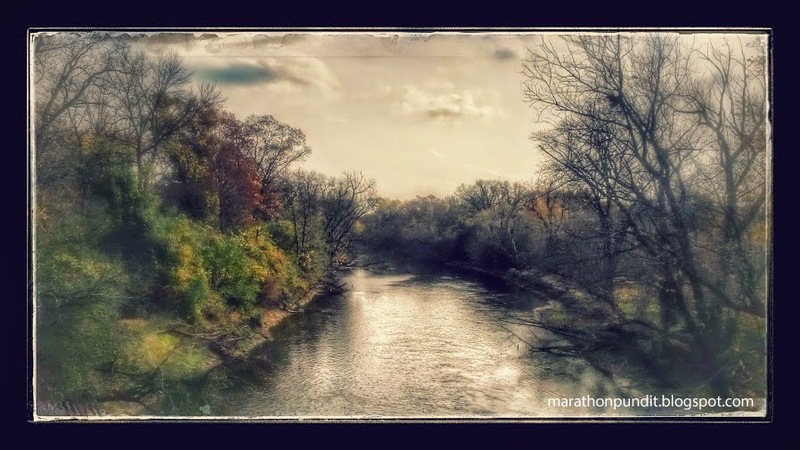 With the help of Google+, a photograph I captured in October at Lions Woods of the Des Plaines River is lookin' darn good. Just as it was during the unhappy times of the Occupy movement, Oakland is the violence capital of the leftists' anti-cop movement. Show me someone who hates cops and I'll show you a criminal. Oh, the radicals don't even respect Christmas and the Prince of Peace. A protest march targeting police shootings turned violent in Oakland on Christmas night as protesters smashed windows, looted stores and damaged a Christmas in Jack London Square. The "No Time Off" march started around 5 p.m. Thursday evening at 14th Street and Broadway with several dozen protesters taking part. Some were hostile from the beginning, with one protester lunging at a KPIX camera moments after the march began. Around thirty windows were smashed between a local Subway restaurant and a BevMo store at 525 Embarcadero West, where bottles of liquor were pilfered and used as projectiles. On Christmas Even a Finnish Santa Claus met his Russian counterpart, Father Frost, at the border of Finland. They exchanged gifts and took reindeer rides. 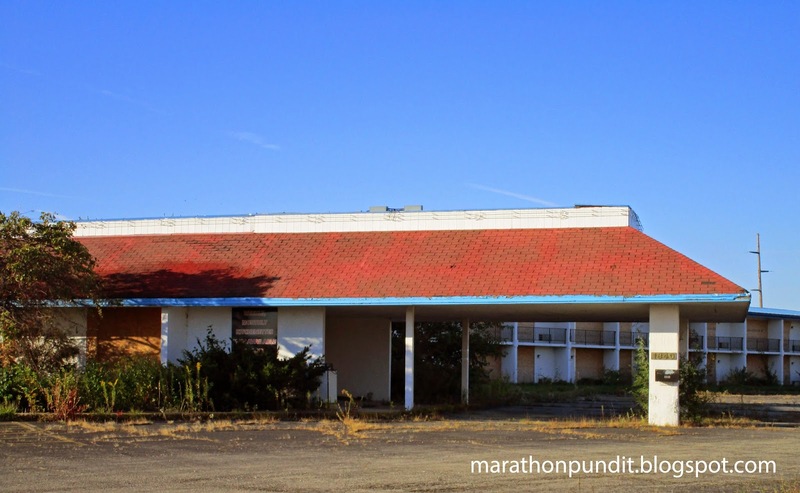 Decades of corruption and government malfeasance in Illinois have led to this development: the Prairie State is losing population. 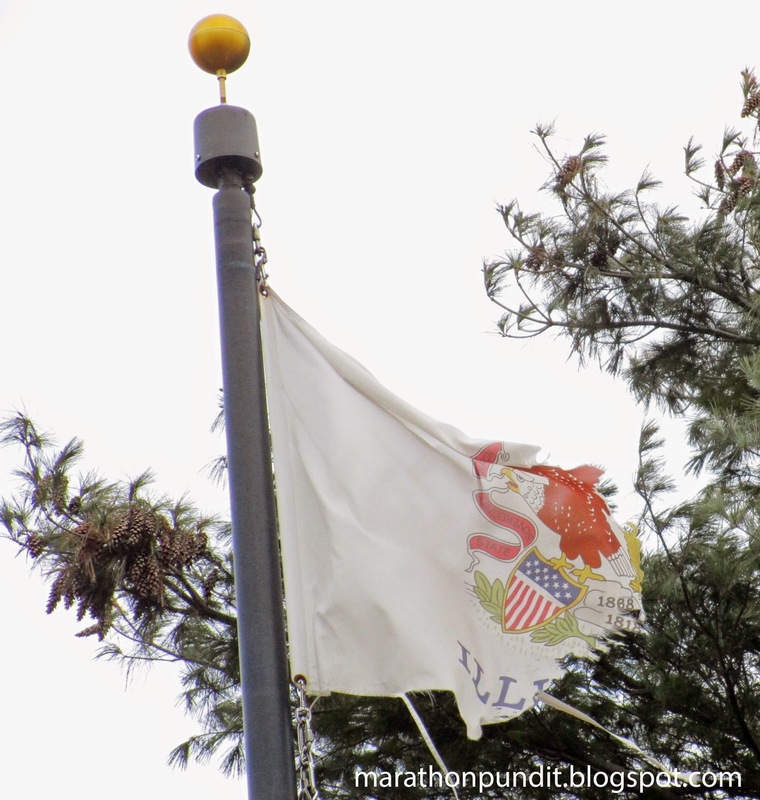 Illinois suffers from the burden of a $100 billion underfunded public pension system and after a recent high of $9 billion, the Land of Lincoln has a backlog of $4 billion in unpaid bills. Four of the last eight elected Illinois governors have served time in federal prison. Five other states, West Virginia, Vermont, Alaska, Connecticut, and New Mexico are also facing negative population growth. The figures come from the US Census Bureau and it covers the period from July 1, 2013 through July 1, 2014. A recent Gallup Poll found that if given the chance, half of Illinoisans would move if they could. Illinois' governor-elect, Republican businessman Bruce Rauner, vows to end the rot. As part of his weekly radio address, Ronald Reagan read from a letter from US sailor who describing to his parents the rescue of dozens of Vietnamese boat people seeking freedom from oppression. Well, I think that letter just about says it all. In spite of everything, we Americans are still uniquely blessed, not only with the rich bounty of our land but by a bounty of the spirit—a kind of year-round Christmas spirit that still makes our country a beacon of hope in a troubled world and that makes this Christmas and every Christmas even more special for all of us who number among our gifts the birthright of being an American. Last night Antonio Martin, an 18 year-old brute, pulled a gun on a Berkeley, Missouri police officer. The cop shot the man. Berkeley borders Ferguson. While such a death is a tragedy, the incident would have ended differently if Martin hadn't pointed his gun at the police officer. Left-wing protesters, viewing the death as an opportunity to advance their agenda, held a rally about the incident in the St. Louis suburb which spilled onto an interstate highway. Can't they let up for Christmas? 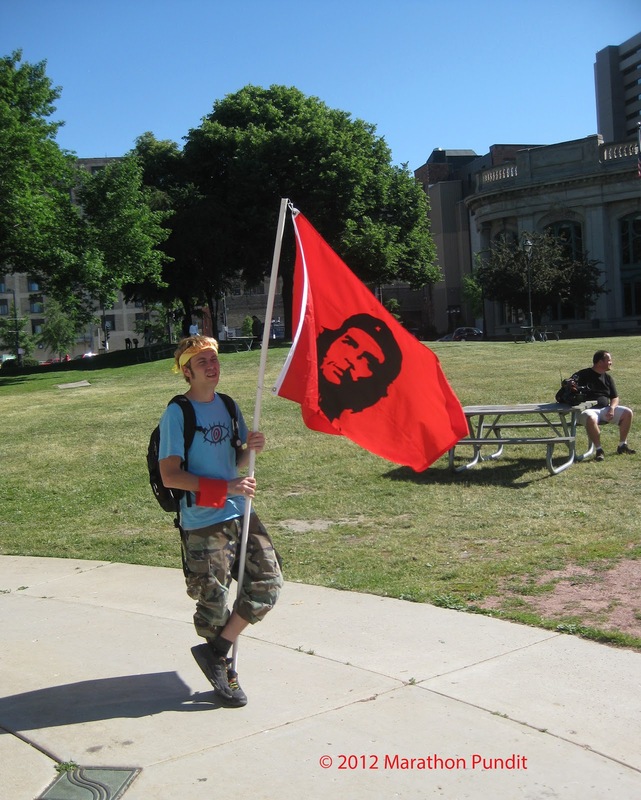 When I asked the arrogant members of Occupy Chicago if they had a permit to march in city streets or camp out wherever they wanted, they'd curtly reply, "The First Amendment is our permit." An Illinois appeals court disagrees with them--but agrees with me. The ruling by the Illinois 1st District Appellate Court reverses a lower court finding that Chicago's 11 p.m. to 6 a.m. curfew at Grant Park violated the protesters' freedom of speech and other rights. The unanimous appeals court opinion posted Tuesday afternoon argues the city had legitimate interests in closing the park overnight, including to dissuade common criminal activity after dark. The ruling says the First Amendment "does not guarantee the right to employ every conceivable method of communication at all times and in all places." Sadly, the Occupy movement didn't go away--it only morphed into the anti-police movement. This is what the Des Plaines River looked like at Camp Baden Powell within Dam Number 2 Woods two days ago. The mindless slaughter on the western front during World War I halted in some parts of 440 mile-long killing field on Christmas Eve 100 years ago. Enemy troops climbed out of the trenches to greet each other in No Man's Land, they sang songs and even played soccer. While there is not peace on Earth this Christmas--again--there isn't wholesale human butchery such as the kind from the Great War. For that we should be grateful. Yes, Kim Jong Un, there is a Santa Claus. Despite the North Korean hack attacks, "The Interview" will show on Christmas. Several movie theaters said they will begin showing "The Interview" Thursday, seemingly putting the comedy back in theaters after Sony Pictures Entertainment canceled its release. The Alamo Drafthouse in Texas said on Tuesday that Sony has authorized it to screen the film starting Christmas Day. Atlanta's Plaza Theater also said it will show the film. Representatives for Sony did not immediately comment. Such a release would enable "The Interview" to open in select theaters and avoid the national chains that dropped the North Korea satire last week. Sony's cancellation of the movie following terrorist threats from hackers drew widespread criticism, including from President Barack Obama. This move by Sony is a victory for free speech. 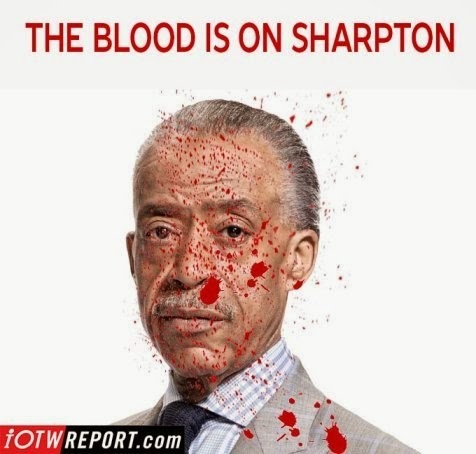 One of the men with blood on his hands in regards to the execution-style murders of two New York cops is race-hustler Al Sharpton. After years of portraying American police as brutally racist and evil, culminating in Sharpton's leadership of the falsely-premised "Hands Up, Don't Shoot" and "I Can't Breathe" movements surrounding the deaths of Michael Brown and Eric Garner, Sharpton certainly bears some culpability for the murders of the officers. He bears even more culpability for the reactions of those celebrating the murders in their aftermath; he, more than anyone else, helped forward the perception that officers treat the black community like "Nazis or Hamas" treat Jews, as Van Jones once told me. Graphic comes courtesy of iOTWReport.com. I'm sure the national media will overlook this story out of Nashville. Brandon Curran thought it was a shame no one was publicly banding together to show support for law enforcement in light of recent shootings, and he decided to do something about it. Plans for a demonstration quickly formed Sunday, and by 6:30 p.m. Monday about 50 people were assembled outside the Metro Nashville Police Department holding signs saying "Police Lives Matter" and "Thank you MNPD." "No one is standing up for them, and it feels like they don't have a public voice like everything else has,” Curran said. "We just want to stand, and the community to see that we're standing. And we want the officers to know that we're sharing in their grief and we're standing with them." Yeah, 50 isn't a huge number, but unlike Al Sharpton and other leftists, regular people don't have access to a rapid-deployment force of protesters who can turn out when given the signal. If you want to know President Obama's position on an issue, I suggest you look back at his answers to a 2003 questionnaire from the left-wing group Independent Voters of Illinois – Independent Precinct Organization. Our longstanding policies toward Cuba have been a miserable failure, evidenced by the fact that Fidel Castro is now the longest-serving head of state in the world. If our isolationist policies were meant to weaken him, they certainly haven’t worked. I believe that normalization of relations with Cuba would help the oppressed and poverty-stricken Cuban people while setting the stage for a more democratic government once Castro inevitably leaves the scene. But in 2007 Obama said in a presidential debate that he was against normalization. MODERATOR: Normalize relations, whether or not Fidel Castro isn't... OBAMA: No, but there are two things we can do right now to prepare for that and that is loosen travel restrictions for family members, Cuban-Americans who want to visit, and open up remittances so that they are able to support family members, many of them who are fighting for their liberty in right now. MODERATOR: But for now...OBAMA: I would not normalize relations, but those two things, those two shifts in policy would send a signal that we can build on once Castro's out of power." Now Obama supports normalization with the Cuban communists. Oh, I forgot. He always has. New York City's mayor, Bill DeBlasio, is a committed leftist. He even honeymooned--in violation of the United States' travel ban--in Cuba. Oh, correct me if I'm wrong, but I don't believe DeBlasio has ever denounced his fellow leftists who chanted in Manhattan earlier this month, "What do we want? Dead cops! When do we want them? Now!" Now that President Obama has handed out an olive branch to Cuba--and especially after the execution-style murder of two New York City police officers last week--this is the perfect time for our government to demand that the Castro brothers to hand over the two cop killers it is harboring, Charlie Hill and Joanne Chesimard, who is also known as Assata Shakur. 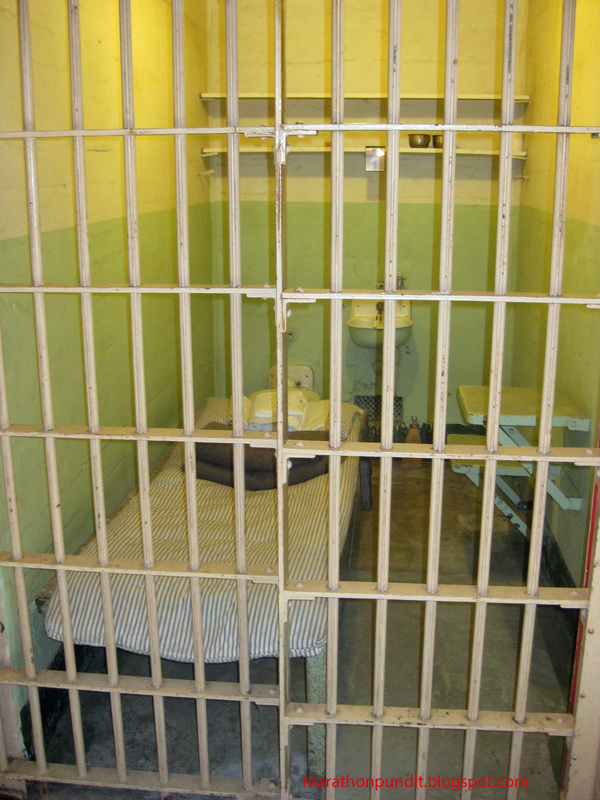 Obama and Attorney General Holder: decent Americans demand justice! The last weekend before Christmas was another bloody one in Chicago. 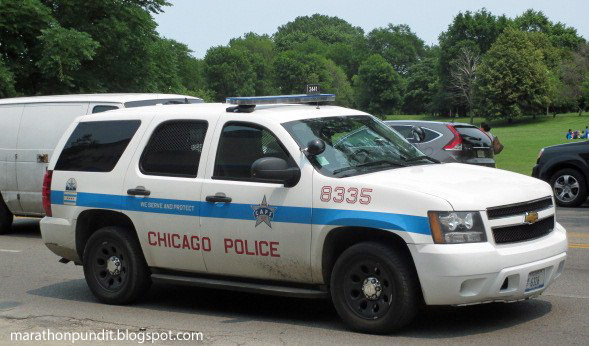 Three Chicagoans were murdered and other 25--including an eight year-old boy--were wounded. New York City's leftist mayor, Bill DeBlasio, has been supportive of the protesters who've been marching in the streets of America's largest city--of course without a permit--chanting, among other things, "What do we want? Dead cops! When do we want them? Now!" Yesterday an assassin traveled from Baltimore to Brooklyn to shoot, execution style, two NYPD officers. Watch as New York cops, in a show of disrespect, turn their backs on DeBlasio before his news conference last night about the hateful killings. From Da Tech Guy: Is race protecting Jackie Robinson West Little Leaguers from ringer allegations? An almost perfect story about a champion team for Chicago's violent South Side may not be what we were told it was. From my weekly post on Da Tech Guy: Is race protecting Jackie Robinson West Little Leaguers from ringer allegations? 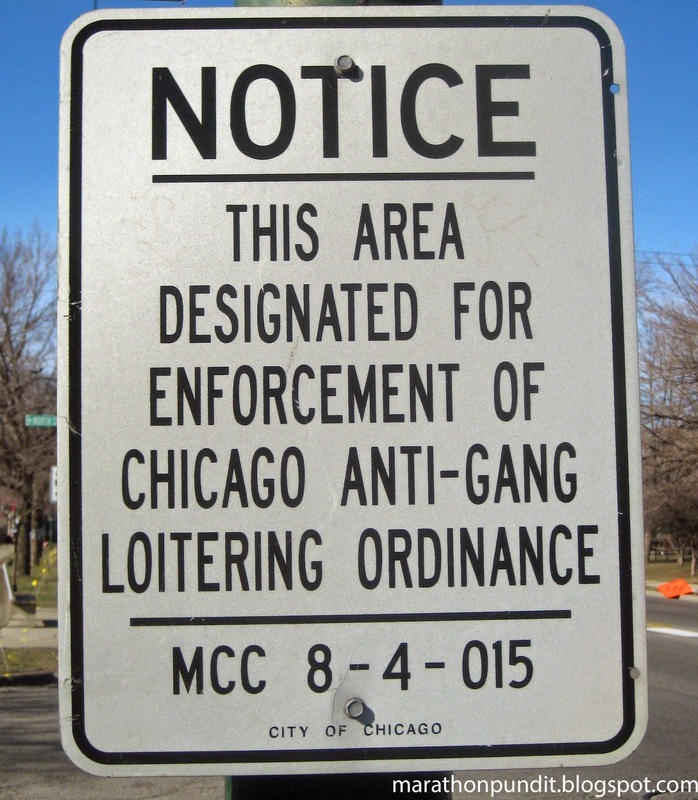 Chicago Mayor Rahm Emanuel and his family live in a pleasant and safe neighborhood. Okay, maybe not so safe, as the mayor's teenage son was mugged Friday night about a block away from his home. He was roughed up a bit and his cell phone was stolen. "What do we want? Dead cops! When do we want it, now," was a hateful chant used last week in New York by ralliers marching--no doubt without a permit--in Manhattan during a protest about the deaths of lawbreakers Eric Garner and Michael Ferguson by police officers. The leftists got their wish. This afternoon two minority New York cops, Wenjian Liu and Rafael Ramos, were shot execution style in Brooklyn's Bedford–Stuyvesant by Ismaaiyl Brinsley of Baltimore, who warned on Instagram, "I'm putting wings on pigs today. They take 1 of ours…Let's take 2 of theirs." Brinsley, who shot his girlfriend yesterday in Baltimore, committed suicide after attempting to flee from the cop murderers. I wonder what the Rev. Al Sharpton, who has been fanning the flames of cop-haters since the summer, has to say. Let's say some brutes try to break into Sharpton's home. Who will the reverend call, the police? Or a community organizer? Rest in peace, Liu and Ramos. 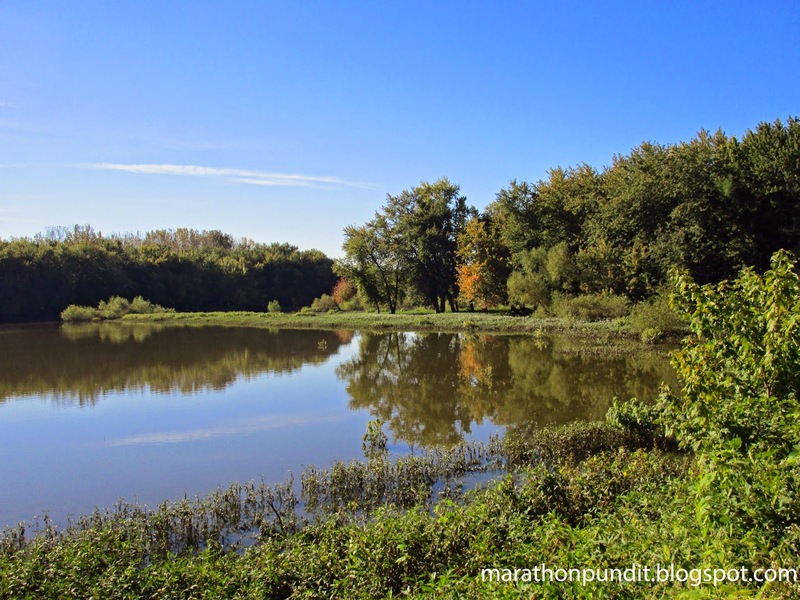 Time to look back at my October trip along the route of the Illinois & Michigan Canal. Pictured here is the Julius W. Hegeler I House, which was built in 1902. It's in the Arts and Crafts style. 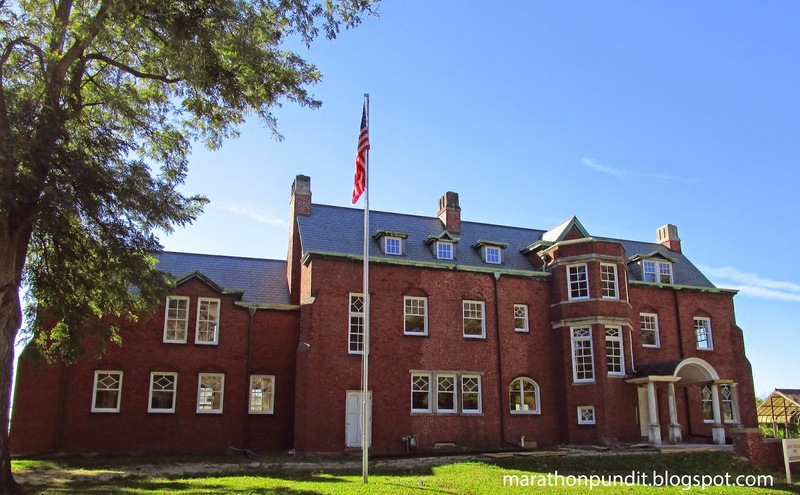 The stately dwelling is across the street from his father's home, the Hegeler Carus Mansion. Liberalization, Charles Krautammer said on Fox News yesterday evening, didn't lead to freedom in China or Vietnam and it won't do so in Cuba. "The bulk of the benefit," Krauthammer said of Obama's move in Cuba, "is going to the military and the oppressive apparatus." It's getting dangerous even during the daytime in Chicago. Between sunrise and sunset, one Chicagoan was shot to death and another ten were wounded. Charlie Hill, a former member of a radical group is wanted in New Mexico; he is the only living suspect in the murder of a New Mexico state trooper. Mr. Hill wound up in Cuba in 1971 after he and two other members of a group called the Republic of New Afrika, were stopped by a state trooper outside of Albuquerque, while transporting arms and explosives. One of them, Mr. Hill does not say who, shot the trooper, Robert Rosenbloom, in the throat. The trio, all of them in their 20s, then forced their way into the Albuquerque airport and hijacked a T.W.A. jet. They left behind their dream of creating a separate nation for American blacks. The other two fugitives died in Cuba. Obama needs to pressure his new Cuban pals to send Hill back to America and face justice. Last week, Illinois comptroller Judy Baar Topinka, a suburban Chicago Republican, died suddenly of a stroke. She won reelection by defeating Gov. Pat Quinn's hand-picked lieutenant governor, Sheila Simon. Quinn, a Chicago Democrat and two-time running mate of jailbird Rod Blagojevich, uses his alleged frugality as part of his own branding. In his only non-negative TV ad used during his failed reelection attempt, Quinn was seen cutting the grass at his Northwest Side home with a manual mower. Until it was found to be a defunct program, Quinn used to wave his membership card from the Super 8 VIP club as "proof "of his thriftiness. Yesterday the lame duck, who presides over a public pensions system that is underfunded by $100 billion, called for a special session of the General Assembly that will cost taxpayers $50,000. Illinois is also burdened by $4 billion in unpaid bills. In that light, sure, $50,000 isn't a lot of money, but $50K here and $50K there, and soon we're at $4 billion. Topinka's passing exposed a hole in the state constitution--she would not be sworn in until next month, but legal experts concur that Quinn's successor, Governor-elect Bruce Rauner, has the power to appoint a comptroller for a full four year term. Quinn's special session has only one purpose--change state law so the Republican will only be able to appoint a comptroller for two years, then in 2016 there will be special election for the remaining two years. All things being equal, in a presidential election year a Democrat will have a better shot winning that race. The only Illinoisans who care about this issue are Democratic political insiders and public officials interested in running for comptroller. Quinn is a partisan hack and a fraud. Good riddance to bad trash. (Video) Krauthammer: Sony wrong to pull "The Interview"
Sony's response to the North Korean hacking attacks and its threats to bomb theaters that show The Interview, a film where Kim Jong Un is the villain, is to yank the movie from distribution. Charles Krauthammer says Sony made the wrong decision. President Obama began his political career in the living room of Bill Ayers and Bernardine Dohrn, the former Weather Underground terrorists. 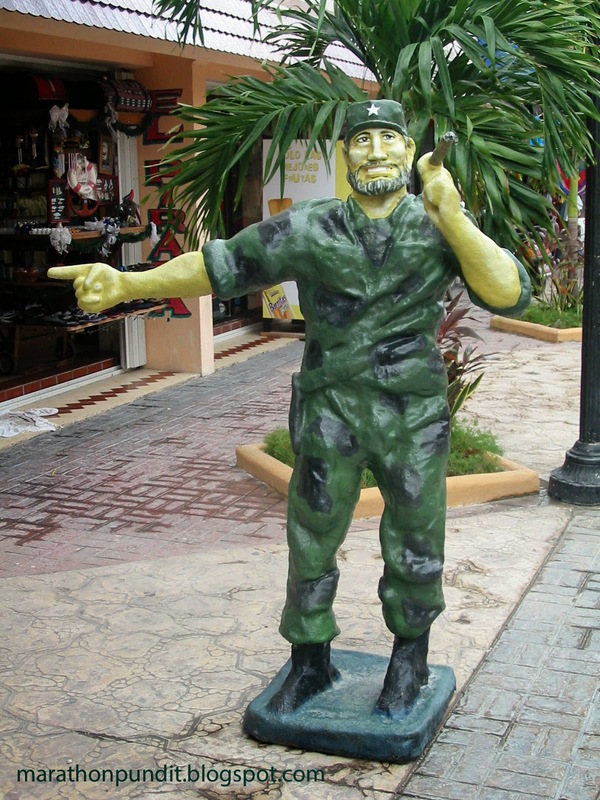 VIVA CUBA! Hands Off Assata Shakur! I’m astonished and relieved and moved. It's terrific when imperial arrogance is pushed back. A victory in the name of patience, irony, hope and struggle. And just who is Assata Shakur? The onetime JoAnne Byron Chesimard, a member of the Black Liberation Army, was convicted of murder for her role in the murder of New Jersey state trooper Werner Foerster. Shakur was the first woman named to the FBI's Most Wanted Terrorist List. Cuba granted Shakur political asylum in 1984. 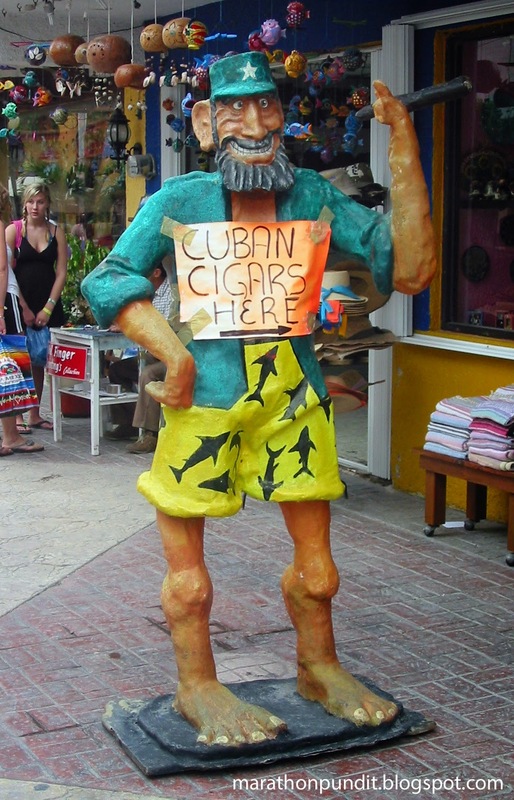 New Jersey wants Cuba to cough up Skakur. If the Castro brothers do that, then that will be the one upside I can identify in regards to Obama's reaching out to the totalitarian state. Oh, if you must see it, here is Ayers' Facebook page. The FBI is awarding a $1 million award for her capture, as is the New Jersey State Police. Below is a 2013 video about the terrorist that the Cubans are harboring. It was cold yesterday and cloudy. 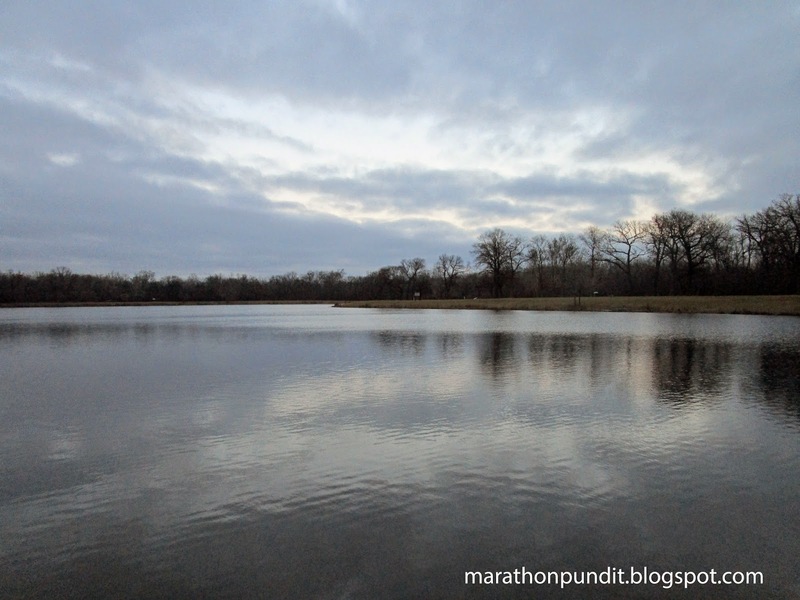 But the conditions opened an opportunity to capture a striking photograph of Axehead Lake in Des Plaines. The Christmas cheer didn't smother Chicago's violent tendencies yesterday. Three Chicagoans were murdered on Wednesday and at least 13 were wounded in shootings that happened all over the city. (Video) Krauthammer on Cuba: "Is there no tyrant In the world Obama will not appease for nothing?" As he is almost always is, Charles Krauthammer is spot-on as he discusses President Obama's left-wing dream come true--recognition of the Cuban government, even though the communist state is a totalitarian nation and a state-sponsor of terror. "Is there no tyrant In the world," he said of Fox News tonight, "Obama will not appease for nothing?" From @Fausta, Cuba: #AlanGross released – is Obama ending the embargo in exchange? Fausta is an expert on Latin American events. She'll be updating her post on Cuba's release of Alan Gross throughout the day. Does Cuba's move mean that Obama is about to normalize relations with the communist regime, one that holds many political prisoners? And while Congress would need to end the embargo against the rogue state, Obama has little need for the legislative branch as he owns the famous executive order pen. Gross should have never been arrested. And Obama should not be using him in a quid-pro-quo exchange with the Castro brothers. Nationwide protests continue over the deaths by police of Michael Brown and Eric Garner. Meanwhile in Chicago, there are no street marches over the four South Side teens--15 and younger--who've been shot since Saturday. One of the victims died. Where is South Side resident Jesse Jackson? Where is Al Sharpton? The values of the Democratic Party are heading further outside of the mainstream. And like many chilly ideas, the source is California. With Republicans threatening to shove climate change to the back seat as they take control of the U.S. Senate, state officials including Gov. Jerry Brown huddled with one of the nation’s leading Democratic donors Monday to talk up ways to keep it on California's agenda — including legislation that could send a shiver through the coal industry. The state Senate's top leader said at an Oakland forum organized by billionaire environmental activist Tom Steyer that he's planning to introduce a measure next year to require the state's public-employee pension funds to sell their coal-related investments. "Climate change is the top priority of the California state Senate," said Senate President Pro Tem Kevin de León, D-Los Angeles. He said his legislation would require that the California Public Employees Retirement System, which manages public employees’ pensions and health benefits, and the California State Teachers Retirement System divest millions of dollars in coal-related investments. "Coal is a dirty fossil fuel, and we generate very little electricity in California from coal," de León said. "And I think our values should shift in California." Steyer somehow became a billionaire even though he was foolish enough to throw away $76 million of his own money to make global warming a major issue in the midterms. (Video) Axelrod: "You hear 'ready for Hillary,' ready for what?" Even longtime Democratic strategist David Axelrod doesn't know what Hillary Clinton stands for as she makes way to run for president in 2016. He all but said so on MSNBC's Morning Joe today. Time Magazine, thankfully, spared decent society the indignity of naming the Ferguson protesters as its Person (Persons?) of the Year. Its Alex Altman offered an air-brushed story about them--and failing to mention that by all sensible accounts Michael Brown was shoplifting before he was shot to death by a police officer--and that the "Gentle Giant" charged the cop. And Altman's piece didn't spend much time on the arson and looting that took place when the St. Louis County grand jury voted not to indict Darren Wilson, the cop who shot Brown, for murder. Correction December 17: Altman mentioned Brown's shoplifting in one sentence. One of the silliest things politicians due is announce that they are going to later announce a run for higher office. It's a cheesy PR trick---it allows the pol two create two media buzzes. Today former Florida Gov. 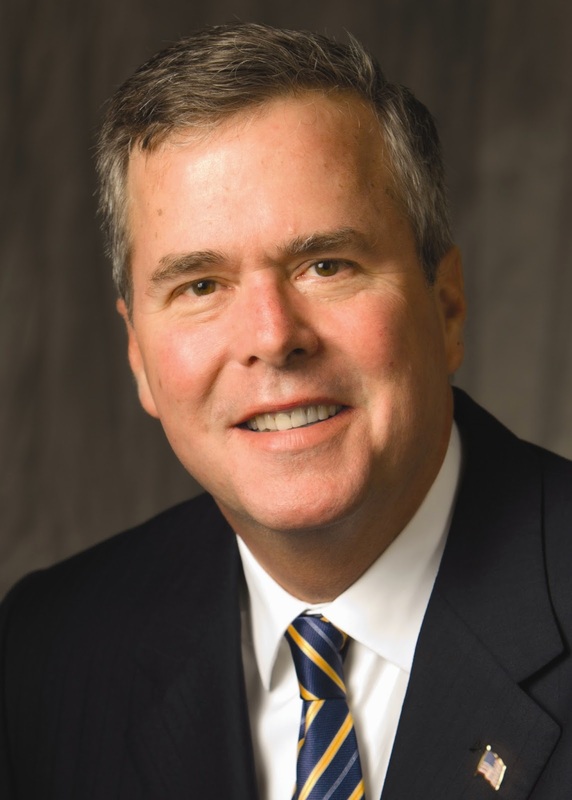 Jeb Bush revealed his plans that we will later reveal his plans about running for president in 2016. Sheesh, Jeb. Just say it. In Timothy Egan's Worst Hard Time, a Dust Bowl sheriff made his media splash when a reporter asked him if he would stand for reelection. "Just tell 'em I'm running again." The day after Australian police stormed a cafe where a jihadist held dozens of hostages--three died, including the terrorist--the Taliban attacked a Pakistani school. Over 100 are dead, most of them are children. A teacher was burned alive and some children were beheaded. At around 5:30am on December 16, 1944, German forces began their last major offensive of World War II in what became known as the Battle of the Bulge. 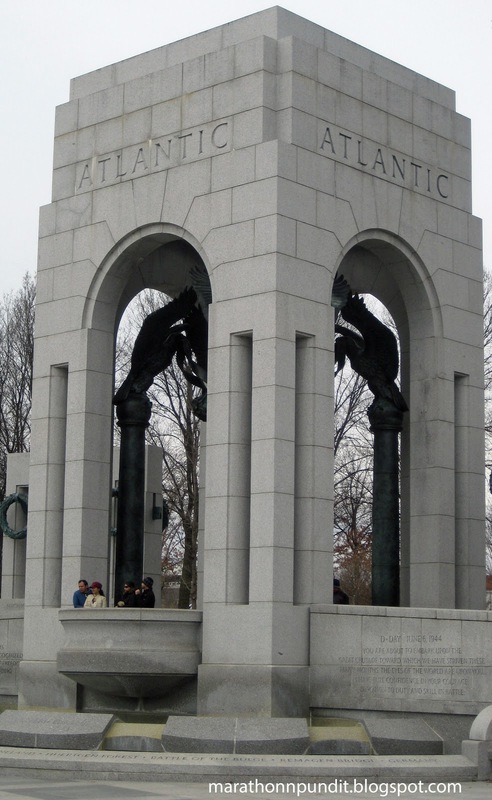 When the battle ended in early February, 19,000 Allied soldiers, nearly all of them American, perished. Three months after the conclusion of the battle, the war was over in Europe. North Dakota has never been known for its ethnic diversity--outside of a smattering of Native Americans, the people of the state are as white as the winter snow. But thanks to the Bakken Shale oil boom in the western part of the state, that is changing. Job seekers and immigrants have brought a surge of diversity to North Dakota, but the arrival of many new people from diverse native lands often result in a few language gaps. Its pervasiveness has caused a number of public agencies to seek help: Teachers and police officers are turning to interpreters and Internet translators. Those with aspirations of acclimating to a new culture have been described as dedicated by many — but there are waiting lists for classes in English as a second language. And in some situations, parents cannot turn to their more fluent children for understanding. Mandan Police Chief Dennis Bullinger and Bismarck Police Chief Dan Donlin said officers more frequently encounter people who speak limited or no English. "There is a system out there where we can call a number. It will translate it to the person you are talking to," Bullinger said. "Last year, we had a Spanish instructor come in and do some basic (lessons) with us in the whole department," he said. "If we had someone who was a victim of a crime and they don't speak English, we'll contact a translator to help." A detective and an officer who speak fluent Spanish at the Bismarck Police help with some of the calls, but officers often use an interpreter national/international service over the phone. "We have a visual poster. The individual can point to the language they speak," Donlin said. "The officer knows he can contact the service whether it's Arabic, Greek, whatever and start the interpretation. The officer will state what they want to ask the individual. The interpreter will state that. ... The interpreter will interpret back in English to the cop." See--oil is good for America. This weekend in Chicago there were protests, as I noted in my previous post, over the Michael Brown and Eric Garner deaths, while on the South Side a 15 year-old boy was shot to death while trying to protect his twin brother. Where are the protests over the teen? 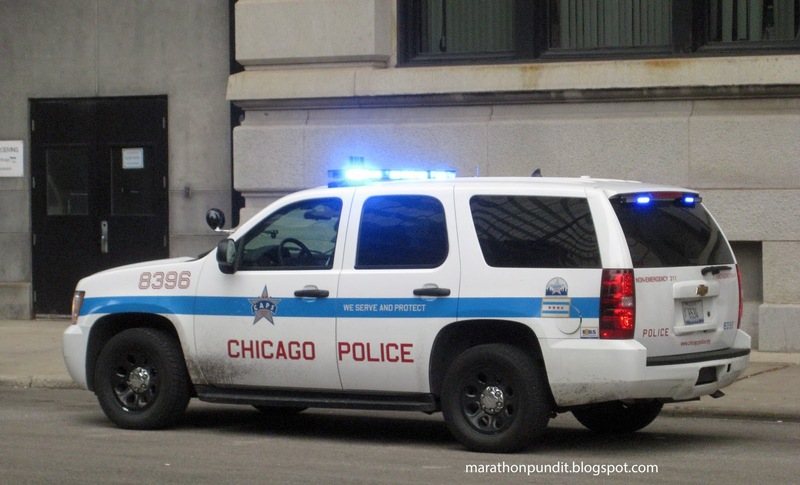 That tragic death was one of three murders in Chicago over the weekend. Another 29 were wounded. Yesterday afternoon there were protests across America, including Chicago, related to the deaths by police of Michael Brown and Eric Garner. Around that time on Chicago's South Side, 15 year-old Demario Bailey was shot to death while attempting to protect his twin brother from robbers. So far there have been no protests related to Bailey's killing, even though his murder fits the far more common pattern of violent death that in which black youths are victims. 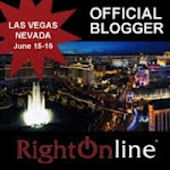 Today on my weekly post on Da Tech Guy, I look at good that can be accomplished by bloggers: Blog, online commenters force arrest of alleged child molester. 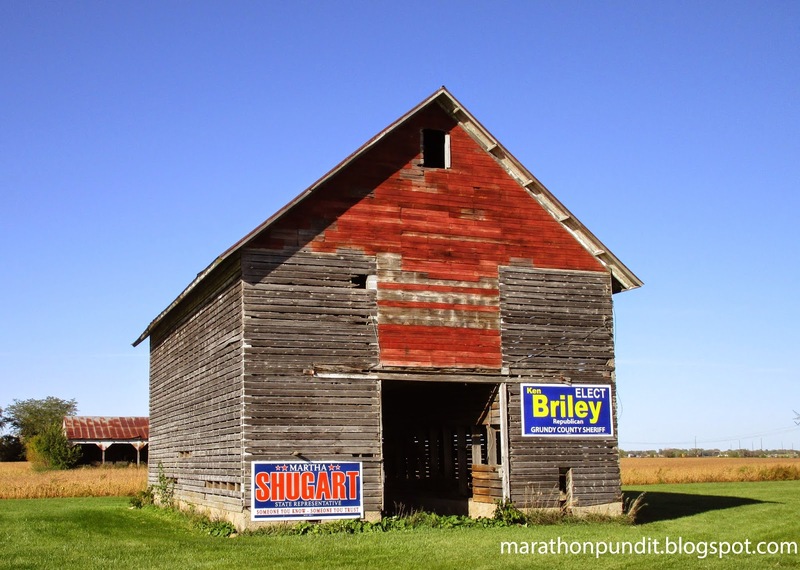 I really like, despite the presence of two campaign posters, how this photograph from my Illinois & Michigan trip turned out. As for the signs, one of the candidates is a Republican, the other a Democrat. Not by design, I assume, but this vintage barn has a striking two-tone look. There is yet more Illinois illness to report. 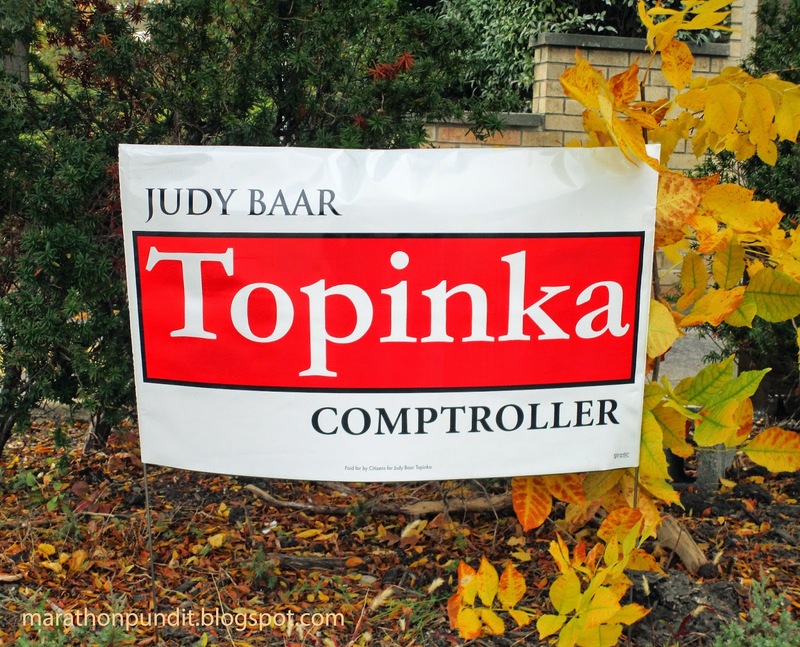 In last month's election, state comptroller Judy Baar Topinka, a Republican, defeated Democrat Sheila Simon. Topinka, 70, died of a stroke on Wednesday. Now Simon, the lame duck lieutenant governor, wants lame duck Democratic Gov. Quinn, whom she wouldn't run with this time around, to appoint her as Topinka's replacement. If that makes sense to you, then you are definitely not from Illinois. 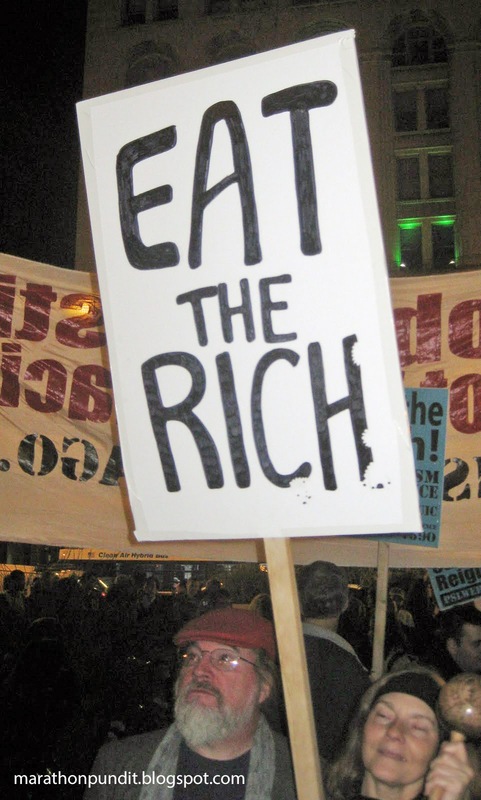 In 2012 President Obama used class warfare in his successful reelection effort. This year in his home state, Obama's fellow Chicago Democrat Pat Quinn tried the same tactic but lost. And on December 11, 1941, Adolf Hitler, in his declaration of war against the United States, also stirred up class warfare. He was defeated too. From Hitler's speech to the Reichtstag that day. The report by Clifford Meacham accuses Berrios of "taking the minimum actions necessary to placate" Meacham and the U.S. District Court Magistrate Judge Sidney Schenkier, who oversees the case under the Shakman decree that bans city and county officials from basing personnel decisions on political considerations in most cases. "The general impression of the employees in the office was that employment actions were based on nepotism, favoritism, or politics," Meacham wrote, referring to the way Berrios makes decisions to hire, fire, promote or demote employees. "To (Meacham) all such decisions appeared to be arbitrary." Berrios is also the chairman of the Cook County Democratic Party. 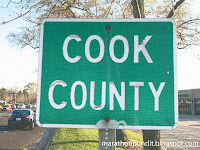 While he was elected to that post by ward and township committeeman, Cook County's foolish voters continue to elect him assessor. Outgoing Illinois governor Pat Quinn is showing his real self. After a dirty and dishonest class-warfare campaign against Bruce Rauner, the Chicago Democrat is playing Illinois-politics-as-usual. If the old Pat Quinn were around, he would be booking a hotel conference room for a Sunday morning press conference to scream about the shenanigans of a lame-duck governor. That Quinn would roast the lame-duck governor for sliding his former campaign manager into a $175,000-a-year job with a two-year contract. That Quinn would complain about the lame-duck governor cutting a questionable Lottery contract settlement on his way out the door. If only that Pat Quinn were around to raise hell. You gotta love those non-violent Ferguson , Missouri protesters. Four Ferguson protesters were charged Thursday in connection with an attack of a man they accused of sending out unauthorized video at a protest strategy session. Yep, it started in a church. 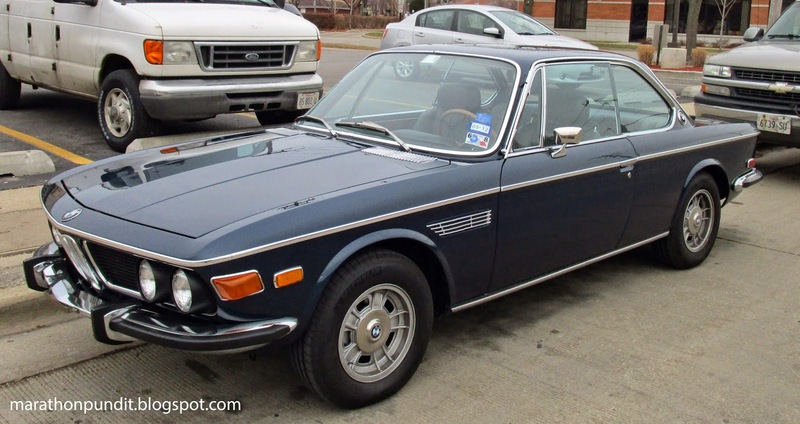 Parked on Lincoln Avenue on Sunday was a a 1971 BMW 2800CS. This vehicle was popular with racers in the 1970s. It's time for me to post photos from my Illinois & Michigan Canal trip that didn't fit into my blog series for various reasons. But of course they are worthy photographs. Below is the Hegeler Carus Mansion in LaSalle, Illinois. 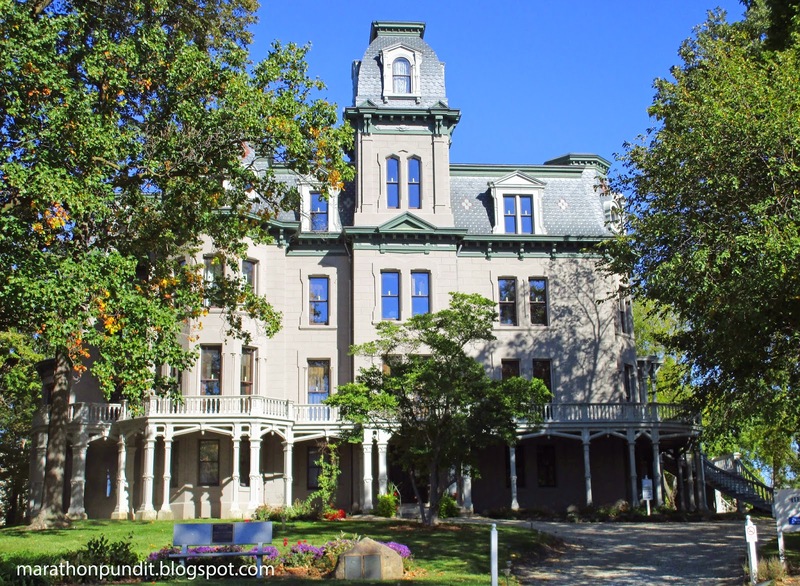 William W. Boyington was the architect for this grand home that was completed in 1876; he also designed the Chicago Water Tower and the Joliet State Penitentiary. This mansion is in the Second Empire Style. Yesterday before a House committee, ObamaCare architect Jonathan Gruber, the man who repeatedly said that that the "stupidity" of the American aided in the enacting of the unpopular law, testified that he knew that "some people" would lose the health care plans they liked, despite President Obama's promises. Leave it to the soon-to-be minority Democrats in the Senate to choose today, when Jonathan Gruber--who said that the "stupidity" of the American voter to helped enact ObamaCare--was testifying before a House committee, to release its report on post-9/11 enhanced interrogations of enemy combatants. They've failed at governing, but they have mastered the news cycle. The CIA's enhanced interrogation program "saved lives and played a vital role in weakening al-Qa'ida," according to a minority report from the Senate Select Committee on Intelligence released on Tuesday. The report was a rebuttal to the majority’s study criticizing the controversial former CIA program as ineffective and destructive. "We have no doubt the CIA's detention program saved lives and played a vital role in weakening al-Qa'ida while the Program was in operation," said the report written by Sens. Saxby Chambliss (R., Ga.), Richard Burr (R., N.C.), James Risch (R., Idaho), Dan Coats (R., Ind. ), Marco Rubio (R., Fla.), and Tom Coburn (R., Okla.). "When asked about the value of detainee information and whether he missed the intelligence from it, one senior CIA operator [redacted] told members: 'I miss it every day.' We understand why," the senators wrote. 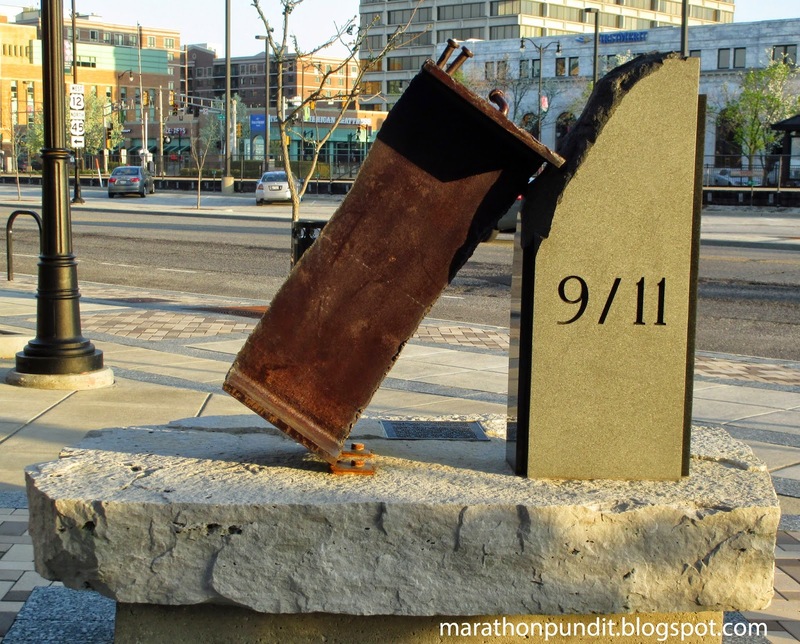 Never forget--the terrorists killed nearly 3,000 people on September 11, 2001. Most Americans still hate ObamaCare. Ask some former Democratic Senators. Yet no fewer than eight of the retirees handed their seats to Republicans: They include Ben Nelson, of Cornhusker Kickback fame, who deprived his state of the pleasure of returning him to private life in 2010. After five terms, Jay Rockefeller was increasingly out of step with West Virginia, not least on ObamaCare. Max Baucus (Montana), Tim Johnson (S.D.) and Byron Dorgan (N.D.) would have had rough rides had they tried to stick around. When they got the chance, voters dumped eight ObamaCare incumbents who dared to seek re-election. 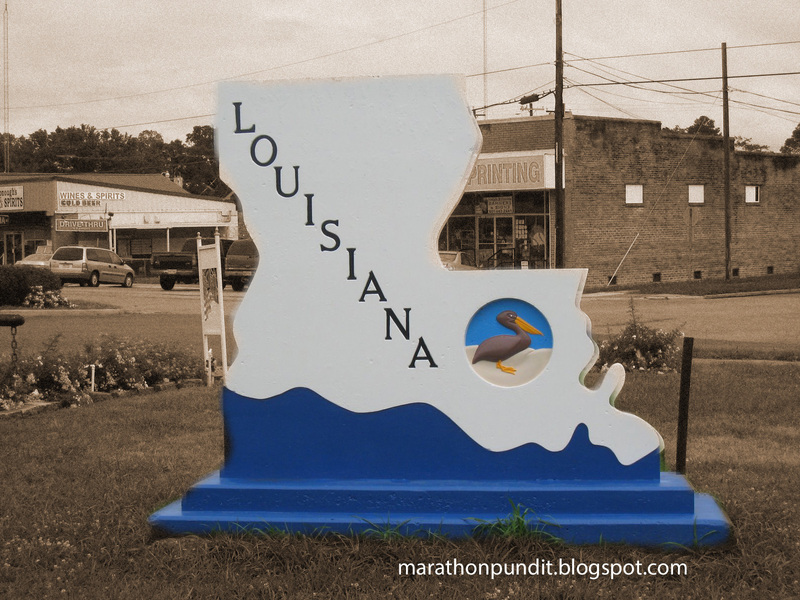 In addition to Ms. Landrieu, four are moderate-in-name-only Democrats who went along with President Obama's lurch to the left: Mark Begich (Alaska), Kay Hagan (North Carolina), Blanche Lincoln and Mark Pryor (Arkansas). But conventional liberals like Russ Feingold (Wisconsin) and Mark Udall (Colorado) also lost in states Mr. Obama carried twice. In Pennsylvania, Arlen Specter left the GOP to vote for ObamaCare after Republican Pat Toomey announced he'd run against him in a primary. Specter, since deceased, lost the Democratic primary to Joe Sestak, who lost to Mr. Toomey in two degrees of ObamaCare separation. MIT know-it-all and ObamaCare architect Jonathan Gruber testified before the House Oversight Committee this morning. However, the ranking Democrat on that committee, Elijah Cummings of Maryland, harshly criticized the economist for stating that ObamaCare became law courtesy of the "stupidity of the American voter." Gruber, who is believed to have made over $5 million consulting on ObamaCare, deflected a question in regards to how much cash he has raked in as an expert on the unpopular program. The afterglow of the election of Barack Obama in 2008 was disturbed by the dark clouds of the arrest of Illinois Gov. Rod Blagojevich on December 9 of that year. 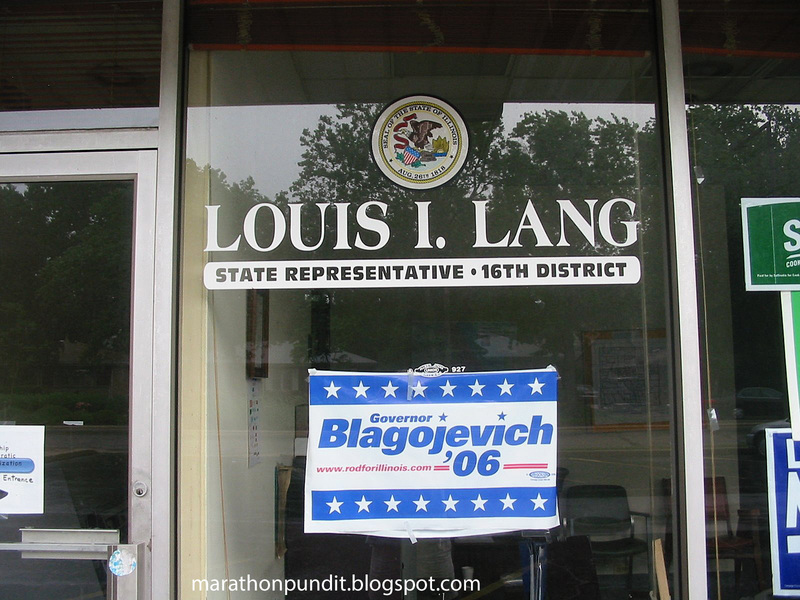 Blago was arrested for attempting to sell the US Senate seat vacated by his fellow Chicago Democrat; he was convicted of a whole slew of corruption charges two years three years later. Time has not been kind to Blagojevich's reputation. Nearly six years after his removal from office by the General Assembly, Illinois' still is burdened by billions in unpaid bills and $100 billion in un-funded pension debt. The pension problem wasn't created by the hair-brained Dem, but it got worse during his six years in office--at his direction payments into the system were cut. The next time historians compile a "worst governors ever" list, expect Blago's name to be near the top--if not at the top--of that tally. Wow, a federal agency looked into the causes of the drought in California and it found--surprise--that global warming has nothing to do with it. Don't blame man-made global warming for the devastating California drought, a new federal report says. A report issued Monday by the National Oceanic and Atmospheric Administration said natural variations -- mostly a La Nina weather oscillation -- were the primary drivers behind the drought that has now stretched to three years. Study lead author Richard Seager of Columbia University said the paper has not yet been published in a peer-reviewed scientific journal. He and NOAA's Martin Hoerling said 160 runs of computer models show heat-trapping gases should slightly increase winter rain in parts of California, not decrease. I haven't posted a vintage automobile pic in a while. Here's one, of a 1996 Pontiac Firebird Grand Am, that was parked here in Morton Grove. While there is no evidence that the beating death--by hammer--of Zemir Begic, a St. Louis Bosnian immigrant by a group of black teens last week had anything to do with his race or his ethnicity, the story definitely is being overlooked by the national media, the one that is obsessed with the Michael Brown and Eric Garner deaths. The local media is paying attention. From the St. Louis Post-Dispatch: Fatal hammer attack shakes Little Bosnia. 80 percent federal loan guarantees available for Asian carp processing plant? It can happen! 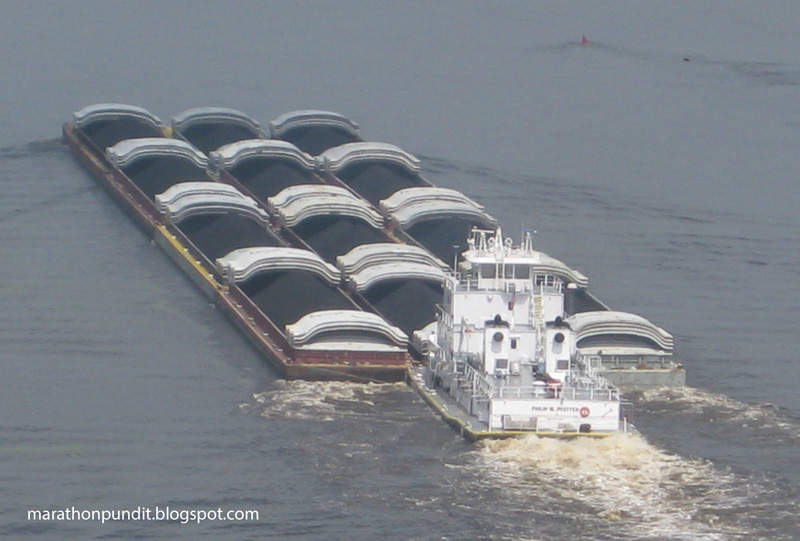 Yes month the small southern Illinois town of Grafton closed a recently-opened Asian carp processing plant that stunk, despite promises that the "green" operation wouldn't smell. Further up downstate in Pekin, the hometown of legendary US Sen. Everett M. Dirksen--more on him in a bit, is considering having an Asian carp plant open up there. 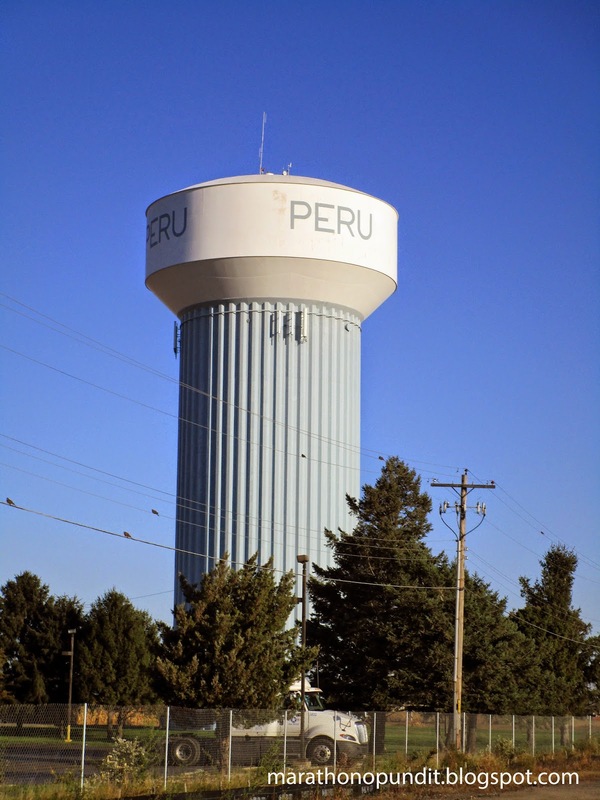 Pekin City Manager Darin Girdler said that the city has had several inquiries by companies considering an Asian carp processing center in Pekin. He said the City Council will decide at its Monday meeting if it wants the University of Illinois to conduct a market/feasibility study to determine the viability of such a venture. The cost of such a study would be $8,000. Girdler said the city may approach other municipalities to see if others want to share in the study. The benefit of the study is that it could make the city eligible to get loans through the U.S. Department of Agriculture that would guarantee loans at 80 percent. So, if the city opted to loan money for the construction of a facility, the city loan would be partially guaranteed. If Pekin wants to let the fish swim in, they shouldn't have federal taxpayers shoulder most of the risk. I get it, Asian carp is an invasive species, but what does that mean to a family in Arizona struggling just to get by? As for Pekin's famous son, Dirksen once reportedly said, "A billion here, a billion there, and pretty soon you're talking real money." Even if it's not a billion, it's still real money. Once again I return to my alma mater a school that has clearly lost it way. 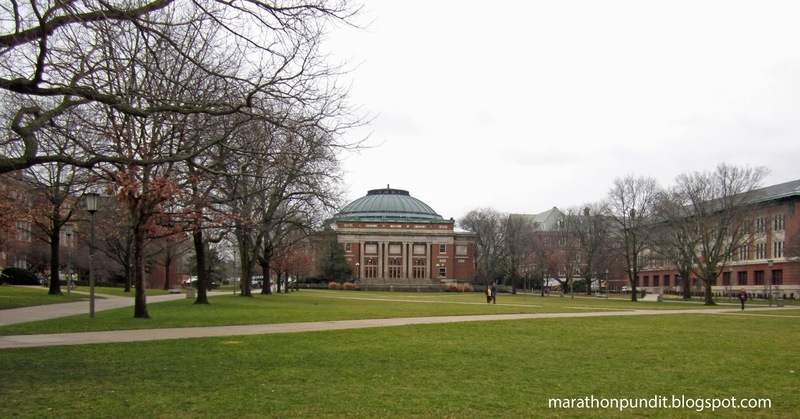 From my weekly post on Da Tech Guy blog: SLA terrorist to return to teaching at University of Illinois. The Republican Party claimed its 54th seat in the Senate--Bill Cassidy defeated Democratic incumbent Mary Landrieu in today's runoff election and he'll represent the Pelican State in the next Congress. There is change--and hope--for America. As for the Democrats, it's a stinging defeat even if it wasn't expected. Next month they'll have not Senators in the Deep South. A quick summary of the story so far. 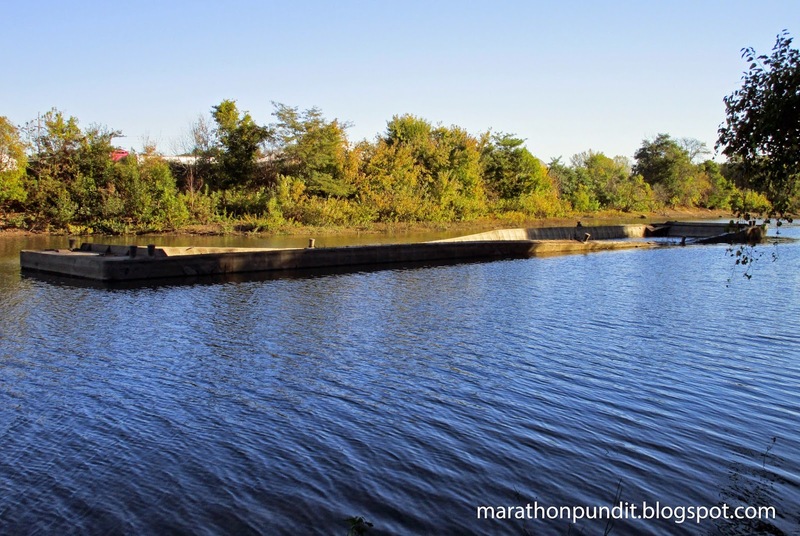 In early October I drove, mostly on US Route 6, through the Illinois & Michigan Canal National Corridor from Channahon near Joliet to Peru in LaSalle County. I visited the canal with Little Marathon Pundit on August 24, 2014--the 30th anniversary of Ronald Reagan signing the legislation creating America's first National Heritage Area. The concept is so Reagan-esque. With the National Park Service serving only in an advisory role, National Heritage Areas are locally-run and locally-funded operations. Although the canal ends--if you include the wider steamboat basin which we'll see next--where the I&M empties into the Illinois River. But because the final lock is in LaSalle, the money ended up there when the canal was in operation. 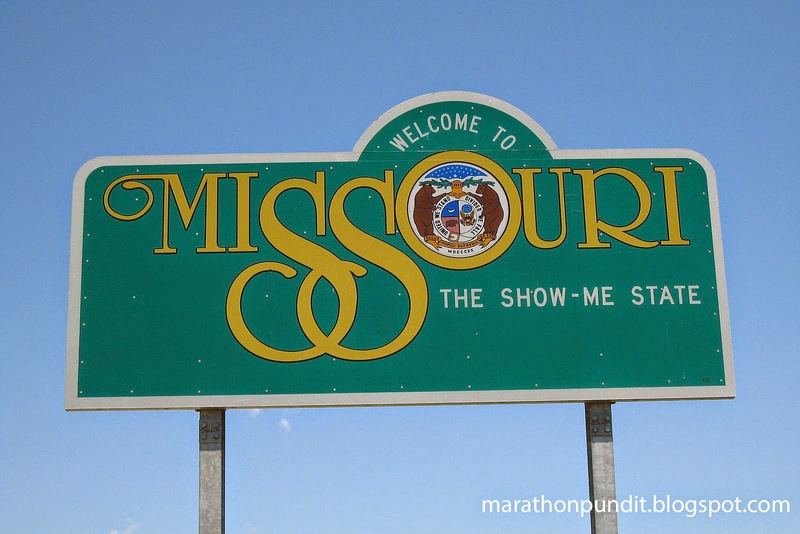 Rather than traffic coming from the canal, the steamboat basin serves as a port for barges that arrive from the Illinois River. 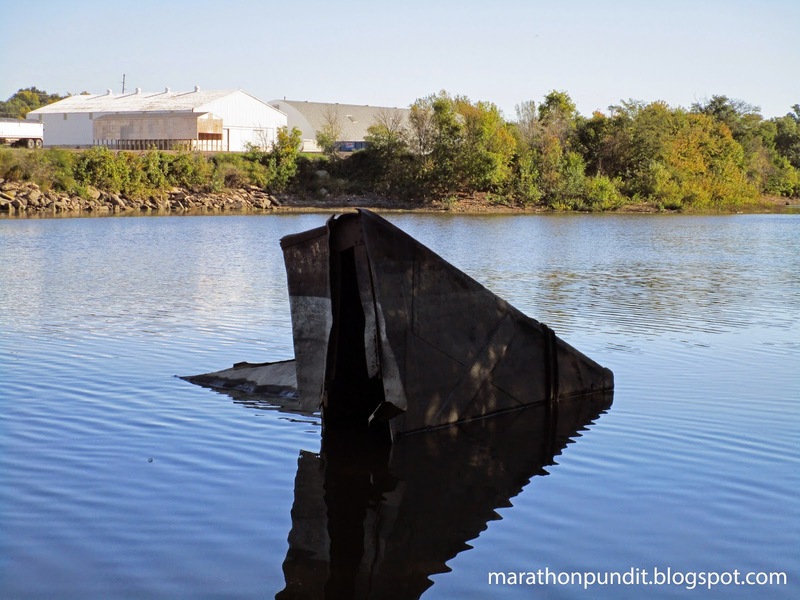 But the abandoned barge in this photograph isn't going anywhere. 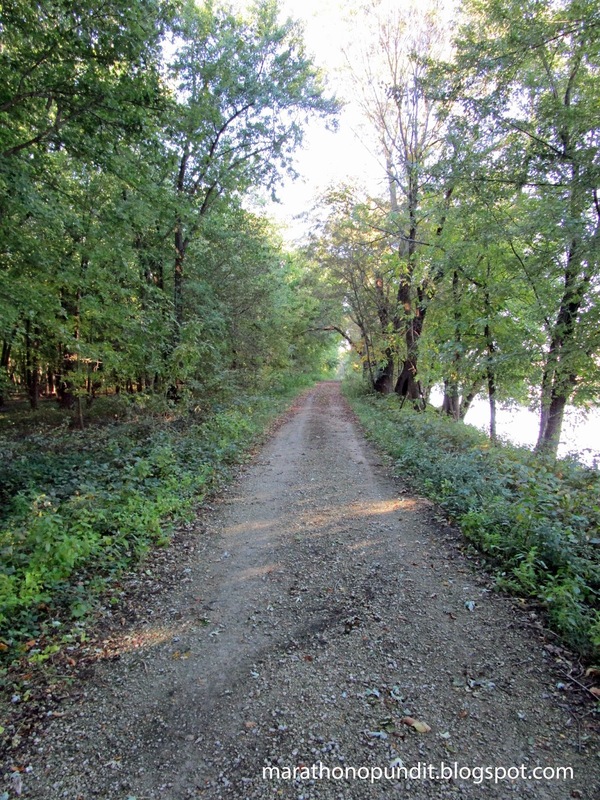 The I&M Canal State Trail is a little rougher in Peru--most of the trail is composed of crushed gravel--perhaps flooding from the river pulled the gravel away. Near the terminus of the canal is Huse Lake. More canal wreckage. To be fair, most of the basin is free of debris. 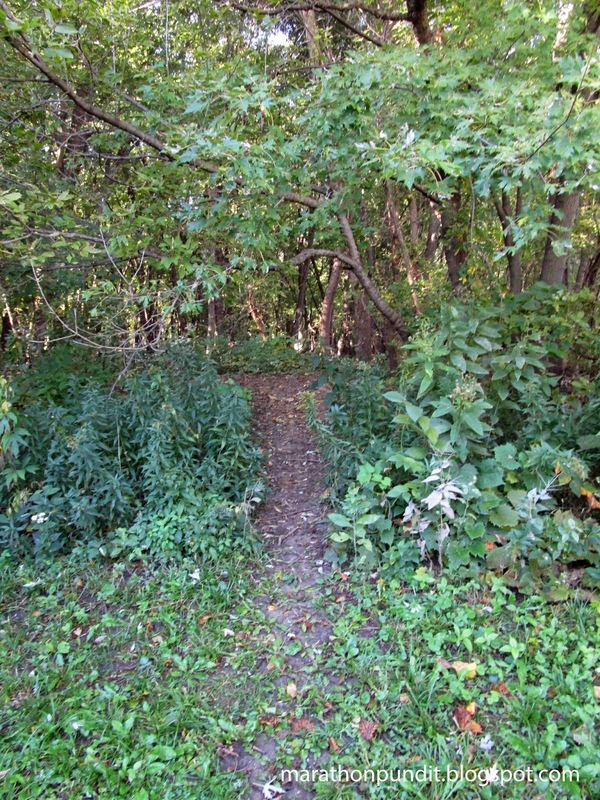 There is a little plaza and a couple benches at the end of the trail. 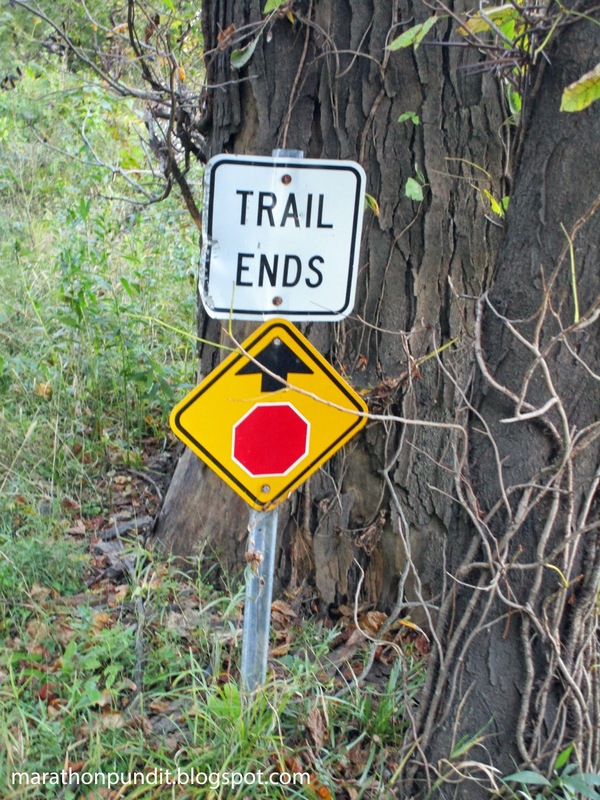 The official trail ends, but the path begins. On to the river! 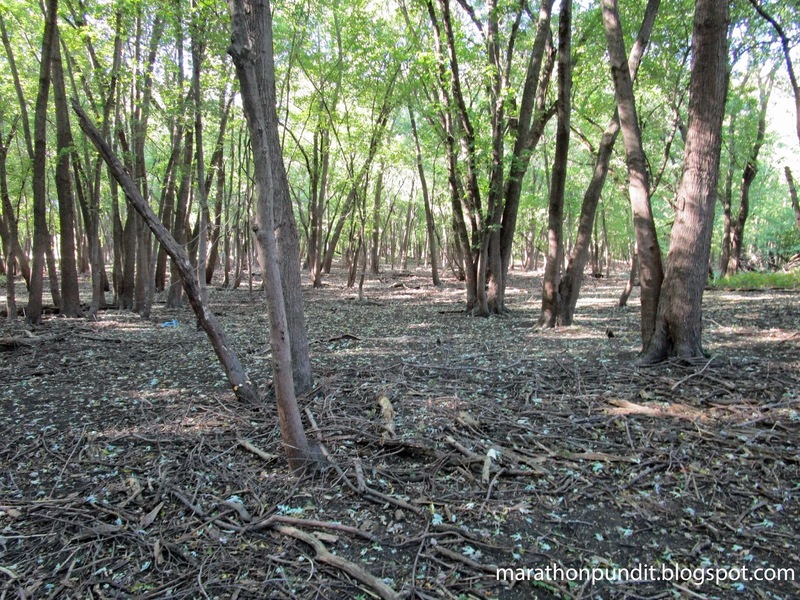 Forests that are frequently submerged in water often look like this one. 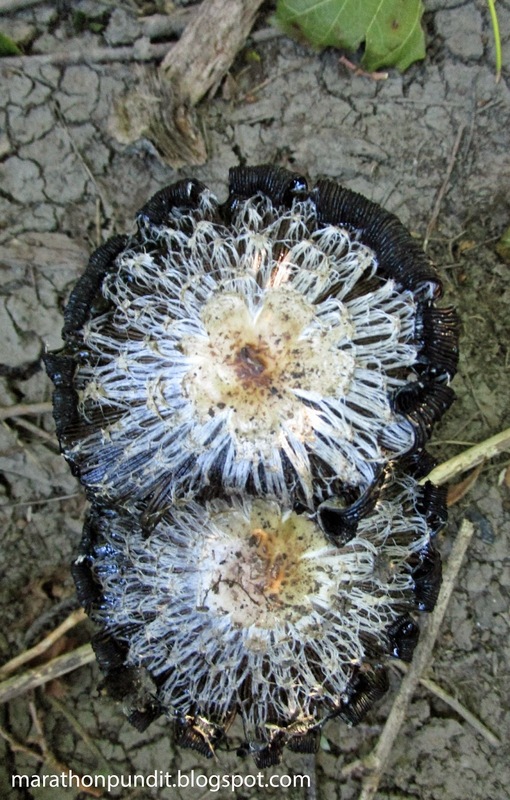 I've yet to identify these striking black, white, and brown mushrooms. The canal meets the river. 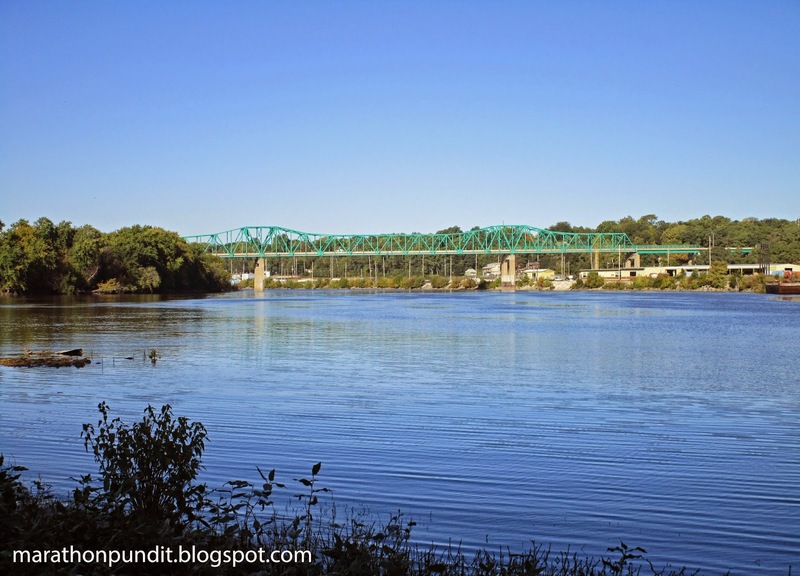 In the background is the Illinois Route 251 bridge. 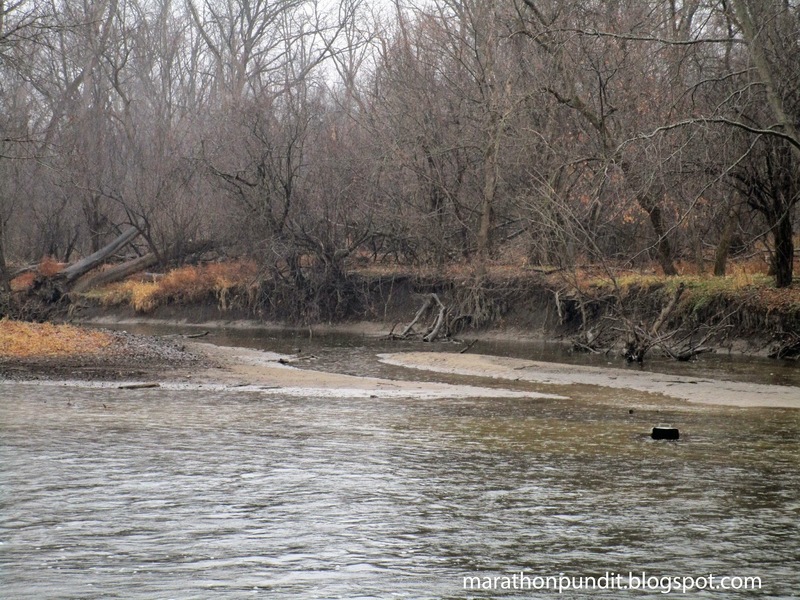 While the Illinois River generally flows southwesterly, where the canal meets the Illinois the river heads north. This entry concludes my series. Thanks for reading!